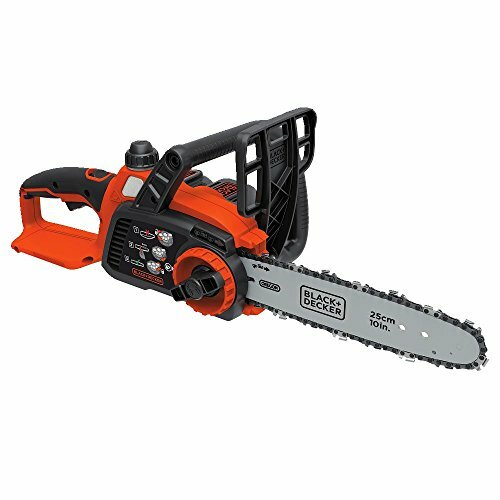 For this post, I have put together a collection of the best chainsaws currently available. 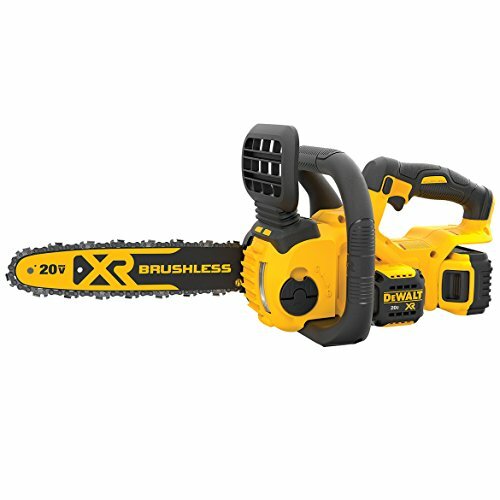 Whether you are trimming branches around the yard, cutting firewood, or taking down a tree, these chainsaws are ready for the task. 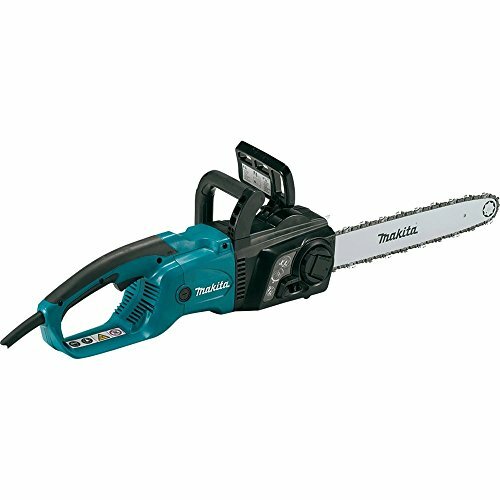 To help you find the right option, I have included gas-powered, electric and cordless chainsaws below. While gas-powered was the typical option, in recent years cordless versions have become much more powerful and convenient. The following chainsaws use the latest innovative components to meet your needs and help to ensure you do your best work. 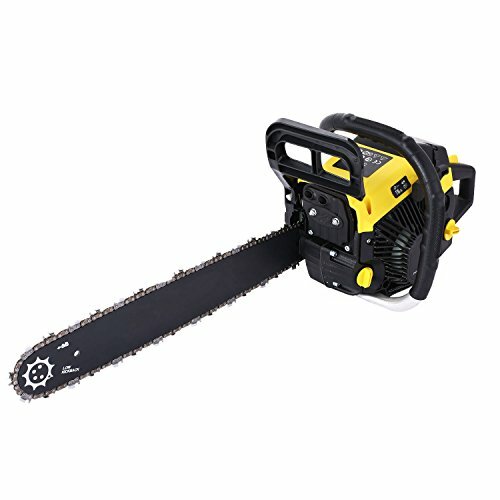 So here is my list of The 10 Best Chainsaws. 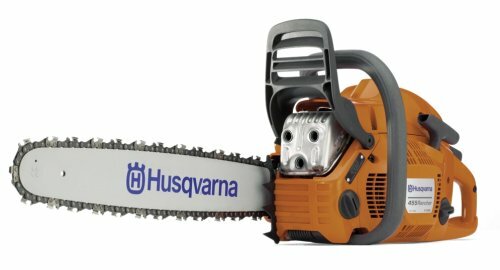 Husqvarna 455 Rancher 20" Gas-Powered Chainsaw with effective anti-vibration dampeners absorb vibration for comfortable operation. X-Torq® technology reduces exhaust emissions and increases fuel efficiency. Less filter cleaning with Air Injection™ air cleaning system. Durable construction and reliable safety features. Smooth starting with minimum effort. DEWALT DCCS620P1 20V MAX Compact Cordless Chainsaw Kit features a high-efficiency brushless motor for maximizing run time and motor life. Delivers up to 70 cuts on a 4x4" per charge. 30 cuts on a 6x6 (with a 20V MAX 5.0 Ah battery). Offers a Low Kick Back 12" Oregon Bar and Chain for construction and outdoor cutting applications. Tool-Free chain tensioning and bar tightening knob for proper bar clamping force. Compact, lightweight design (8.8 lbs.) allows for maximum user control. Battery-operation eliminates carb issues and cold starts with traditional gas-powered chainsaws. 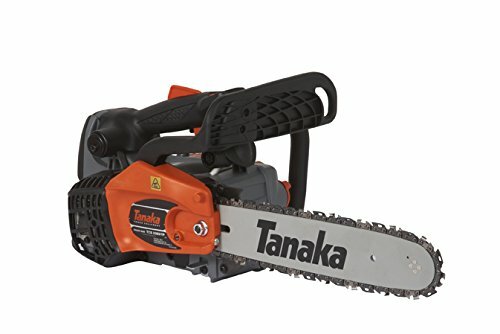 The Tanaka TCS33EDTP/14 32.2cc 14-Inch Top Handle Chain Saw with Pure Fire Engine built for the commercial user for pruning, shaping and hobby work. Features a 32.2cc 2-stroke commercial grade Pure Fire engine that provides clean, powerful performance with less fuel consumption. Sprocket nose bar with Oregon chain provides added control for easier cuts. Side access chain tensioning providing quick and convenient chain adjustment. Half throttle choke with purge primer bulb for easy start and warm up. Easy access to rear air filter, anti-vibration system for user comfort, built-in lanyard ring for easy climbing and an outstanding power-to-weight ratio reducing fatigue and resulting in higher productivity. 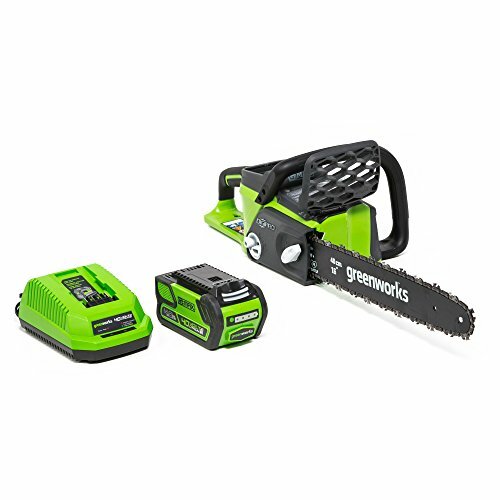 Gas comparable alternative chainsaw solution you have been looking for with up to 30% more torque and up to 70% less vibration than gas powered chainsaws. Greater efficiency and less noise with more torque. Features a heavy duty Oregon bar and chain. 0.0375 chain pitch, chain brake, metal bucking spikes and an automatic oiler. DigiPro Brushless System offers gas comparable performance. 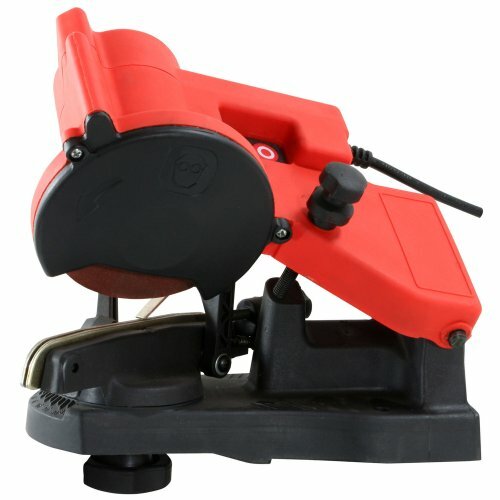 Easy to use while providing the high performance needed to get your yard work done quickly and efficiently. "Tool-less" blade and chain adjustments for convenient operation and easy maintenance. Ergonomic trigger and asymmetrical handle. Low vibration, easy to use. Increased comfort with soft inlay. Equipped with assisted starting system and quick stopping control. 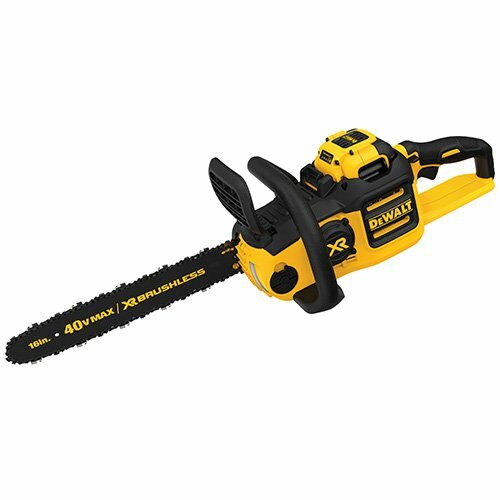 DEWALT DCCS690H1 40V 6AH Lithium Ion XR Brushless Chainsaw, 16"
DEWALT DCCS690H1 40V MAX Lithium Ion XR Brushless 16" Chainsaw, 6AH delivers the performance of gas with the convenience of cordless. Chain brake for kick back protection, along with a variable speed trigger for user control. Features auto-oiling with LubriLink and LubriWell delivering smooth cuts, long chain life and reduced maintenance. The quarter-turn oil cap allows for quick oil re-fills. Tool-free tensioning system which allows for quick bar and chain adjustments with no additional tools required. WORX 16” chainsaw offers gas-free, hassle-free operation. Auto-tension system includes a single, oversized knob that automatically secures the bar and chain and maintains proper tension while you’re working. Auto-tensioning system also extends bar and chain life by eliminating any chance of over-tightening. All-metal dogs at the base of the 16” bar help add stability during cutting, while an easy-to-lubricate sprocket on the bar nose helps preserve the life of the tool. Features an automatic oiler that provides constant lubrication to both the bar and chain along with a 6.75-ounce oil reservoir with an oil level indicator. Built-in safety chain brake that stops the chain in seconds whenever improper contact is made, protecting you in the event of kickback. Rubber over-molded rear handle and ergonomic full-wrap front handle let you work in full control and comfort. Designed with big jobs in mind, the RM4620 Outlaw chainsaw comes with a gas powered 46cc engine. QuickStart technology you can rev up and get right to cutting. Professional-grade die-cast chassis is made to stand the test of time. Side-access tensioner makes chain adjustment a snap. Isolated handles and cushioned grip keep vibrations low and your hands steady and comfortable. BLACK+DECKER LCS1020 10-inch 20V Max Lithium Ion chainsaw features the 20v Max lithium battery for long run-time and long life, staying charged up to 5x longer. 10" premium Oregon low kickback bar and chain that provides smooth and fast cuts. The tool-free blade tension system allows for improved ease of use and quick adjustments. Lightweight design for ease of maneuverability and reduced fatigue at only 7.2 Pounds. Wrap around bale handle provides increased control and comfort. Improved oiling system with a clear window to gauge oil level. 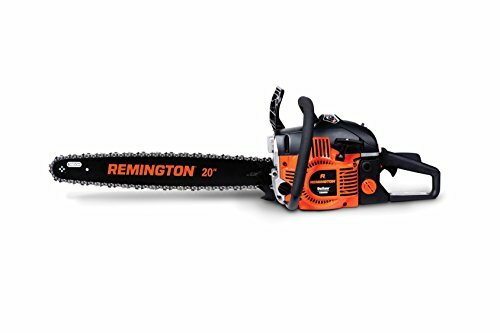 I hope this list of the best chainsaws was helpful.